French tarragon (Artemisia dracunculus) is an aromatic and flavorful herb that is used extensively in the kitchen. It is added to many soups, sauces, egg dishes, fish, poultry and vegetables as well as in vinegars and oils. French tarragon is different from the more commonly available Russian tarragon. French tarragon’s sweet, pungent flavor is far superior to the sharp, somewhat bitter taste for which Russian tarragon is known. Select an area in full sun with good drainage. Finely till or dig the planting area to a depth of 8 or 9 inches. Rake and remove clumps of grass and roots, and break clumps of soil into fine particles. Work in plenty of compost to lighten the soil and incorporate nutrients. French tarragon is susceptible to root rot, and compacted or clay soil will cause the condition. If the soil is heavy clay, you can also mix in some sand or perlite to improve the drainage properties. Substitute peat for compost, if necessary. If you use peat, mix a 10-10-5 organic fertilizer into the top 8 inches of the planting area. Choose plants with good top growth and healthy root systems. French tarragon is not grown from seeds; the plants seldom have flowers and they do not produce viable seeds. True French tarragon is propagated only by root divisions or rooted stems. Seeded tarragon is Russian, not French. Make root divisions or cuttings in the early spring, if you have established plants, just as the plants are emerging from dormancy. Divide plants every three or four years. Open a planting hole in the prepared bed. Set the transplant at the same depth it was growing in the pot. Water the new transplant to settle the soil around the roots, making sure there is no standing water. Space French tarragon plants 24 inches apart. French tarragon is shrubby, and mature plants will be 24 to 30 inches tall unless clipped for use. Mulch with organic material to retain soil moisture and inhibit weed growth. French tarragon has shallow roots, so surface moisture retention is important. Fertilize once when setting out the plants, and no more is needed. French tarragon develops better flavor when soil nutrient levels are low. Use mulch as your main weed control. 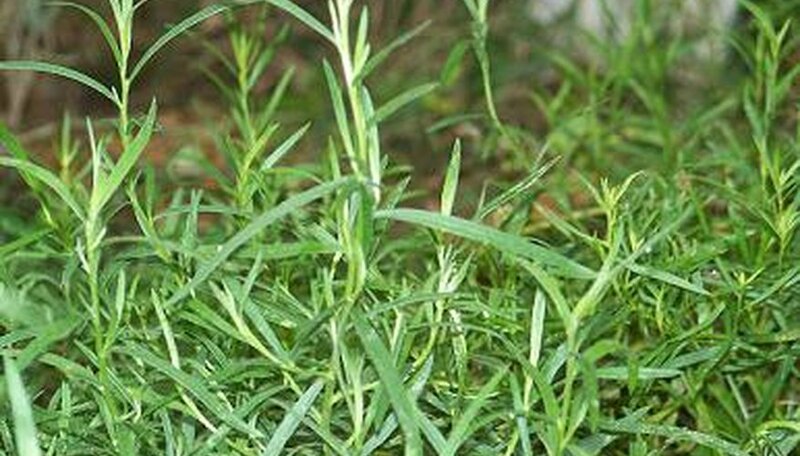 Use care if pulling weeds or hoeing is necessary, because the shallow roots of French tarragon are easily damaged. Use French tarragon in companion planting to repel pests from other garden plants. French tarragon is not bothered by insect pests. Trim back your French tarragon plants, pot them, and move them indoors if your winters are cold and harsh. In areas with mild freezes, prepare outdoor plants to overwinter by trimming back the tops after the first frost. Place a heavy layer of mulch over the plants for protection. The indoor plants need six hours of bright sunlight a day. Light fertilizer at potting time helps them overcome transplant shock and begin new growth indoors. French tarragon is grown as an annual or perennial. If you usually have prolonged ice or snow, or temperatures that dip below 20 degrees, bring some French tarragon plants indoors to ensure having plants for next spring. French tarragon benefits from partial light shade if summer temperatures are above 90 degrees.